Born 2 December 1989, Montana. Sofia University St. Kliment Ohrdiski, Department of Biology, Bachelor's of Science Degree in Biology (2008—2012). Herpetology, biology, ecophysiology and ecology of lizards, spatial and feeding relationships between lizards (Lacertida, Scincidae, Anguidae), species and ecosystem conservation. Work with kids in Educational center in Sofia Zoo, presentations about different amphibians and reptiles and showing a live snakes and other reptiles. 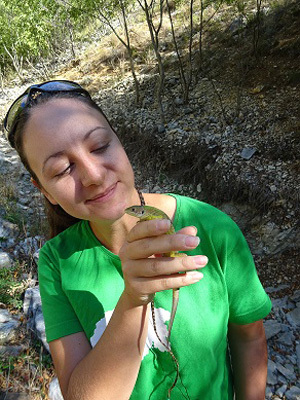 Seminar of ecology — 2014, with International participation, IBER — BAS, poster ‘Spatial niche partition among five sympatric lizards in North-West Bulgaria’ a first prize for best poster presentation award.